The eight major cities with the highest total cost burdens range from the predictable – Chicago and Detroit – to surprises such as Wichita, Kansas, and Portland, Oregon. Make no mistake: the state and local governments with the largest cost burdens face enormous challenges and unpleasant solutions. But the general situation isn’t nearly as dire as the worst headlines indicate. 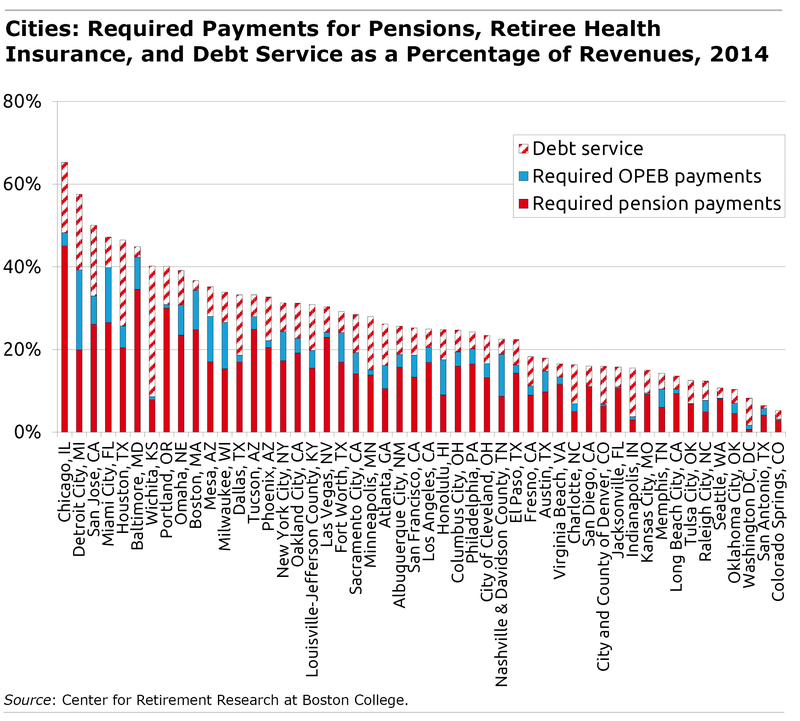 But what about future retroactive pension increases? 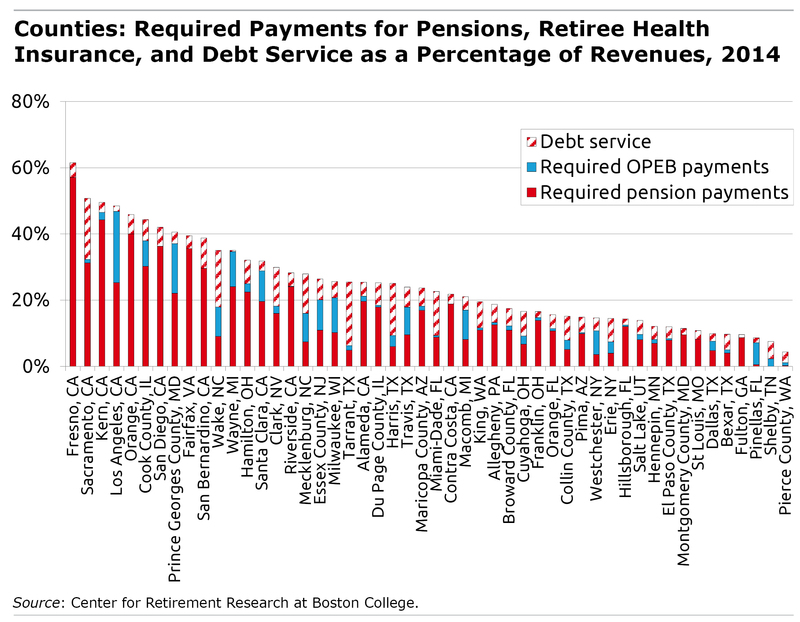 New York City is up to six pension tiers. The state legislature passed bills to eliminate Tier VI this year. The Governor isn’t running for President yet, so he vetoed them. But what about 2020? 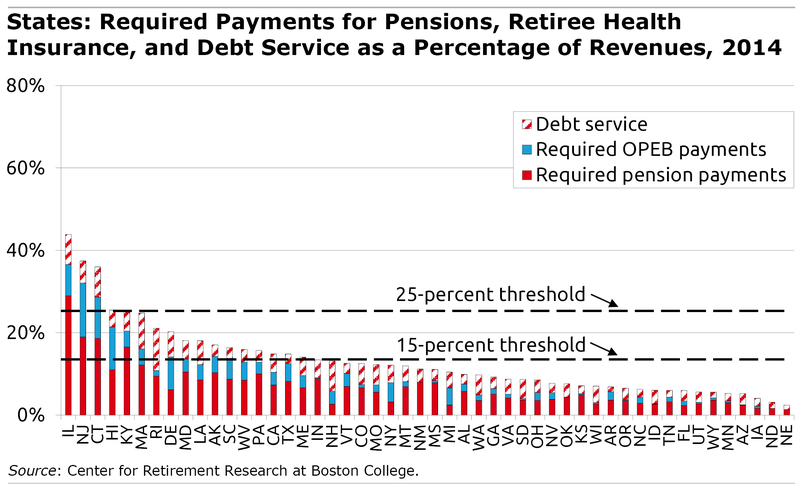 Meanwhile, pension contributions are being made on the assumption of a 7.0% return from the peak of another stock market bubble, and retirement at age 63 instead of 55 for younger public workers. And we have seen in NY they will pass pension increases regardless of the consequences, as they have avoided blame with the help of those who say there isn’t a problem. The problem in Illinois is the state constitution that guarantees retiree benefits will remain as they are. Every plan submitted to fix the problem has been rejected as unconstitutional. The problem in Illinois is that the state did not keep it’s commitment to make regular payments as required by law. The state either made no payments in some years or reduced payments in others. Thus the state was borrowing from the pension funds to fund the state. If we were talking about Social Security, the employer is required to pay the prescribed amount. That keeps Social Security solvent. What would happen if employers could simply decide not to pay the employee contributions? That is what happened to the state pension funds. Now it is time to pay the loan back. I’m sorry but not surprised to see Prince George’s County, MD on the list with total service costs topping 40%. This county just celebrated the opening of the MGM Grand Casino at National Harbor. They seem to think they’ll be able to gamble their way to prosperity. In my opinion, a 30-year fixed level dollar amortization period — while better than a lot of entities are currently using — is far too long to avoid intergenerational transfers. Thirty years MAY be appropriate for benefit increases for current workers, but what entities are currently increasing benefits? While there is no single right answer, an amortization of no more than 10 years for existing shortfalls, and 5 years for gains and losses, would go a long way to ensure that we’re not unfairly burdening future taxpayers to the benefit of current taxpayers. I think you captured reality quite well, and concisely. Thank you for laying blame where it belongs, and for recommending a rational way forward. Has Illinois started paying their lottery winners or are they still pending payments due to a large deficit, uncontrolled spending, waste, poor financial planning, etc?